THE FA Cup made its name on romantic tales of small clubs battling against the giants of the game, creating gripping stories that get retold time and time again. But this year, France has a fairy-tale that would rival any FA Cup saga – little Les Herbiers of National 1 taking on Paris St. Germain. The Coupe de France often throws up the unlikely – since 1999, 10 clubs from outside the top two divisions in France have reached the semi-finals. This season there were two – Chambly and Les Herbiers – and they were drawn to meet each other in the last four. 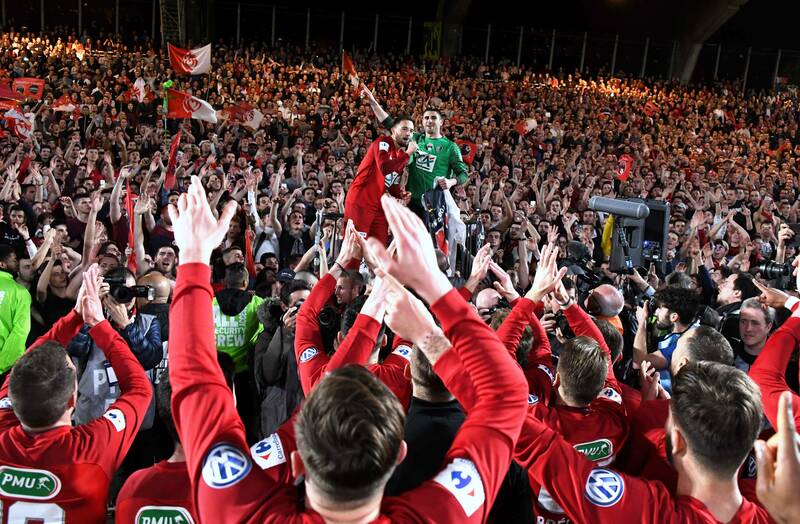 Both were struggling when Les Herbiers beat Chambly 2-0 in Nantes in front of 35,000 people – to claim a place against the mighty PSG in the final on May 8. These unlikely heroes have failed to reproduce their cup form in National 1, in fact there’s a good chance they might get relegated to National 2. With just two games remaining, Les Herbiers are level on points with Pau with 36 points and two in front of Consolat Marseille. Les Herbiers, arguably, have a tough finale, facing teams in the top six – Laval on May 4 and Béziers away on May 11. The key will be the home game against Laval, given Béziers are near the top. Pau, who have beaten Les Herbiers twice this season, face bottom-placed Créteil and top club Red Star, while Consolat travel to Boulogne and host Dunkerque. It is likely to go down to the final day, by which time, the team from Vendée will have made more history or been cast in the role of lambs to the slaughter. The town, Les Herbiers, has a population of 15,000 and around 10% of them watch the club at their Stade Massabielle. They like their cycling and the town hosts the Chrono des Nations, a one-day bicycle race held every October. Essentially, Les Herbiers is comparable to a non-league club in England with loyal volunteers keeping it going. They are not strictly amateur but the players benefit from federal contracts. It is a relatively young squad with most of the team in their peak years. The semi-final goals were scored by Florian David (25) and the tireless Ambroise Gboho (23), while the leading scorer is the fleet-footed Kévin Rocheteau, who is on loan from Niort. Cameroon striker Rodrigue Bongongui has been vital in the Coupe de France, scoring four goals. At the moment, the locals are right behind the club as it prepares to face PSG. Since reaching the final, the town has been buzzing with talk of the big game in the Stade de France. Tickets are selling well, with almost 15,000 being snapped-up already. “This is about football business against football of the heart,” said one club official. However, Les Herbiers will greatly benefit from reaching the Coupe de France final – they received €1.2 million for getting that far. Given that the club’s budget is around € 2 million, compared to PSG’s €540 million, this is big money. Les Herbiers have been fortunate in the draw and when they face Neymar and co. it will be the first clash against a Ligue 1 team. Their cup run started with a win against Balma and then Romorantin, Angoulême, FC Saint Lô Manche, Auxerre and Lens were all beaten (the latter on penalties) before the semi-final. Their league form has arguably suffered in the meantime, with one win in the past five games. The meeting with PSG will go down in history as Les Herbiers’ finest moment, but either side of that game on May 8, Masala’s team will be fighting to stay in National 1. The next week or two could be a bitter-sweet experience for the club’s small and loyal band of fans.